It is interesting to make you look like a dinosaur by dressing a dinosaur costume. You can find a lot of dinosaur costume products on Amazon, eBay and many online shopping sites. But most dinosaur costumes we usually see are for kids or some inflatable costumes for adults; these dinosaur costumes are not truly realistic. Here we will introduce you what is a realistic dinosaur costumes. 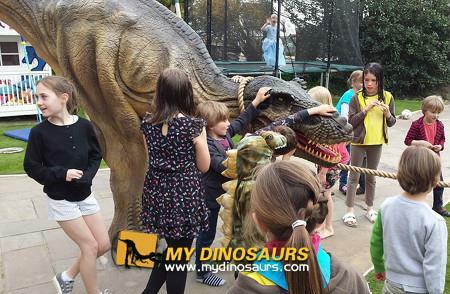 A realistic dinosaur costume should look really realistic and it can be used to scare and surprise others. It should come with fully animated movement. A performer inside the dinosaur costume can controls the movement of the head, mouth, eyes and sounds utilizing a special steering wheel. Clear sight is possible through the built-in camera system, and the performer can stay cool as there are internal fans! There are mainly two style of realistic walking dinosaur costumes: one is with the hidden legs, the other is with visible legs. Usually costumes like this can be customized by the manufactures. All the realistic dinosaur costumes are tailor made according to the operator’s height, legs length and shoulder width. And any kinds of species of dinosaurs like T-REX, velociraptor, spinosaurus or even dragon can be use as the costume model! 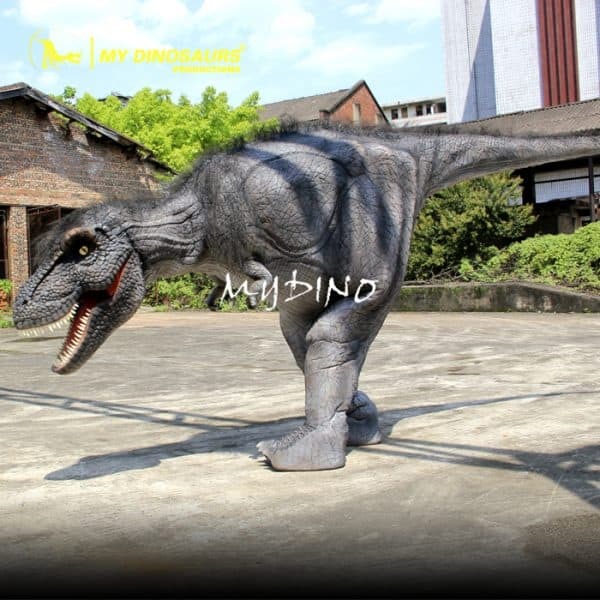 With the articulation points, movable limbs and jaw, blinking eyelids and life-like sound system A realistic dinosaur costume is custom built to look, feel and sound like a real, living dinosaur. By getting such a dinosaur costume, you can use it for good education and entertainment purposes. 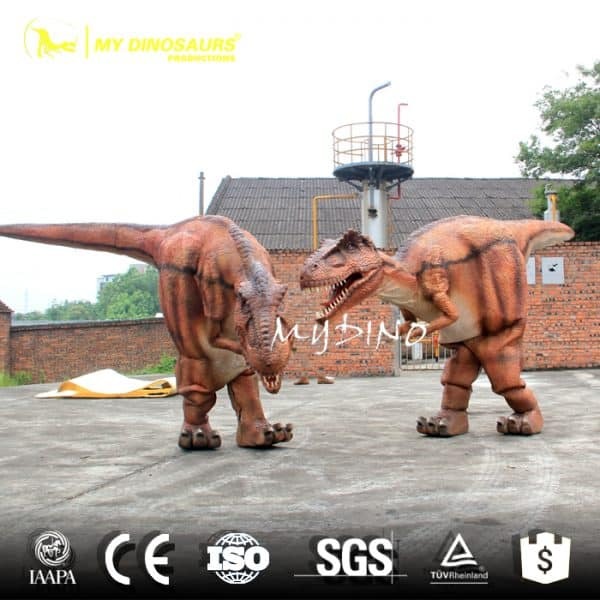 We have seen that the realistic dinosaur costumes can used in parties, Jurassic dinosaur theme parks, museums, science exhibition, performance, festival, Hallowmas, cinema, supermarket and so on. Imaging that you dress in a T-Rex costume and rush to downtown without waiting. Children there would be very exciting when they see the T-Rex Costume. They would gathered around you, wondering if this dinosaur real or not. Meantime, the T-Rex suddenly open her big mouth, roaring to give kids a big surprise. In the entertainment park, visitors will be able to see and interact with the realistic replicas and even stick your head inside their mouths. The dinosaur costumes to be use to play some pranks. You can find a lot of funny dinosaur prank videos on YouTube. Want to own such a realistic dinosaur costume? You may contact My Dinosaurs, a professional dinosaur costume manufacturer. You can find many realistic dinosaur costumes on their product catalog. 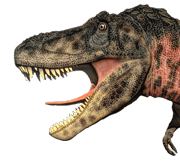 This entry was posted in Dinosaur Attractions and tagged animatronic dinosaur costume, dinosaur costume for school event, realistic dinosaur costume, walking dinosaur costume.